On Sunday the Berlin Adler won their home game against the city rivals Berlin Rebel 41:0 (14:0, 21:0, 3:0,3:0) and remained the No. 2 team in the German Football League North Division standings. Under extremely hot conditions of more than 30 degrees Celsius the Adler were “on fire“ right from the start. The first two offensive drives resulted in Touchdowns. First Quarterback Darius Outlaw scored with a 18 yards pass on WR/RB Talib Wise. The second Touchdown Outlaw ran himself over 19 yards into the endzone. This day the Adler Defense was also red-hot and send the guest team from the field with an early 3-and-out. After 7 minutes the home team was leading 14:0 and never looked back. "This time we played perfect football from kickoff on. We didn’t do that in our previous games this season" - said Outlaw. In the beginning of the second quarter the Adler Offensive machine began to stumble for a moment, when Rebels Linebacker Paul Mehling intercepted Outlaw few yards before the endzone. Apart from that little mistake Outlaw was playing outstanding against his former team: 4 total Touchdowns (3 Passing, 1 Rushing), 20/27 passes for 214 yards and 54 yards Rushing are fantastic numbers on GFL level. On the opposing side Rebels playmaker Conor Lynch had to pay his dues. At the Jahn-Stadium Lynch led the Rebels on the field for only the second time this season and produced 3 Interceptions and 3 Sacks. Often times pressured by Adler defenders he had to hurry outside the pocket. Lynch’s 10 rushing attempts were as many as Running Back Larry McCoy. During the rest of the second quarter the Adler were paying textbook football. All three remaining offensive drives by the Rebels ended in interceptions. Adler team president Steve Seehawer picked 2 passes, Pierre von Rymon-Lipinski caught another interception. Due to impressive defensive plays all the following Adler offensive drives started in Rebels territory. Talib Wise showed his versatility with 5 runs and 5 catches for 104 total yards. The Outlaw-Rise-combo extended the lead to 21:0. After a Seehawer-Interception Wise ran the missing yards into the endzone to score the 28:0. The finale points of the first half came from Receiver Max Zimmermann, who hauled in a wonderfully timed 29 yard pass. In the second half Danish kicker Philipp Anderson scored two more Field Goals. Due to the high lead, the Adler bench players also got plenty of reps on the field. The Rebels can only dream about such a luxury. „Unfortunately we can’t compensate injuries with our thin roster. A few weeks ago we had to send home DB Cartier Rice, because he was too injury-prone. As soon as a player goes IR, our whole system collapses. Unfortunately that’s the case for us this season“, said Rebels Defensive Coach Thomas Breddermann. Adler Head Coach Kim Kuci now only has a short week to prepare his team for the next match-up in Kiel on Saturday. The Baltic Hurricanes also have 4 wins under their belt and are right behind the Adler in the GFL North standings. 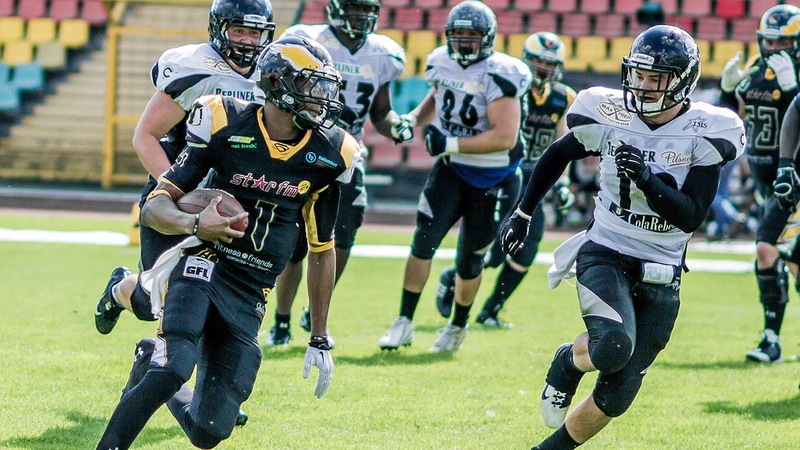 The winless Rebels have to go to Braunschweig this week to face the undefeated NewYorker Lions. 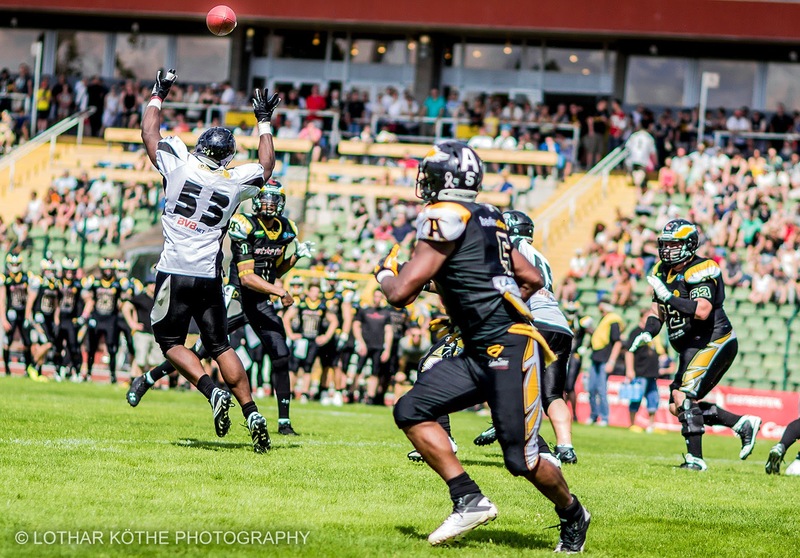 On July 19 the Adler and Lions will play against each other for the Eurobowl title in Berlin’s Jahn-Stadium.